House Hunting: Can or Cannot Buy? Note: Please note that the term `house' used in this FAQ refers to any type of housing e.g. terrace, semi-detached, bungalow, HDB & executive, apartments / condominiums and any other properties that are on sale in Singapore. I am looking for either a brand new or a good second-hand resale house. How do I go about finding a house that has good Feng Shui that suits my whole family members? From past experience, this is one is the biggest headache for any family members. A new house is our the greatest capital expenditure and most of us intend to try to find what we feel is a good or excellent house. But often, we end up at a lost or end up not finding any suitable house. Or if we do, we are not too sure if it suits us or has good Feng Shui. Try to find out the reason why the owner wanted to sell their house? Always try to find out the reason why the owners wanted to sell their house? It would be nice to hear if the owners are upgrading e.g. to a condominium unit. (A comforting thought although it may not necessarily mean that the house is suitable to you or your family members). However, if we learn otherwise e.g. the owners ran into financial problems or divorce cases, it is also best in such cases to have a second consideration of such a house before hastily committing to the purchase. Can I bring my family members to check on the house? Yes! Bring along all your family members if you can! Preferably, take it as a family outing. Get the reaction from each family member about their impression of the house. What are things we can look for when buying a house? Protect, protect, protect! Here, stand at the main entrance door and look out of the house. Do the same at each bedroom window. Look out for any poison arrows in the form of the edge of another building or a temple, a hospital or a lamp post slicing thru the main door or window. In many of such situations, it can be corrected. However, some of the corrections may not be practical all the time. For example, it would imply e.g. using a curtain or blind to block the view (permanently). Are there any significance in missing corners or protrusions in a house? Click here to learn the significance of missing corners or protrusions in a house. Where possible, try to buy a house that has few or no missing corner(s) or protrusion(s). In general, houses with rectangular shape are considered to be `better' houses. How about the toilet location? We cannot normally change the toilet location. And since toilet has a `water' position, the wrong placement of the toilet can cause financial problems to the owners. This is particularly true if the toilet is located at the centre-point of the house. Where possible, the toilet should share an external wall of the house. The toilet should also not be next to the main entrance or above it. These are very inauspicious locations and unfortunately, difficult to cure unless it is relocated to another area. Avoid purchasing such a house if you can. What is `Quantum Leap' in Feng Shui? You can say that `excellent houses' are rare indeed! You must be considered very lucky to find such houses. 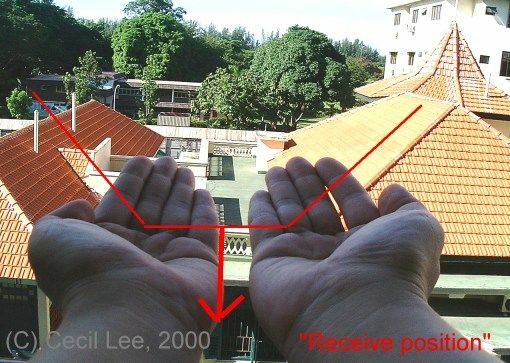 The characteristics of such a house is the `Receive Position'. Where your house is ready to receive luck. In the picture below, (at the expense of your neighbours). Did you see the good units in the above illustration? You will notice that the good units are showered with good luck or in a similar "Receive position". And many other case studies in the Singapore Property Review. Are these all the tips on finding a good house? No, certainly not. You can say that the above tips are just a `tip off the ice-berg'. But these are some of the most common pitfalls which you and your family can becareful of. Do you have any FREE resources on your website to help us find a good house? When you were finding your own house how do you do it? We are all aware that placing a deposit on a choice house has to be a `quick process!' Any minute wasted and our dream house is lost forever to others! "This report was first devised specifically for our own use particularly to find good houses/apartments fast. In Singapore, we all are aware that new housing developments get `snapped' up very fast just within a few minutes/hours or even a day. When Robert first wrote this report, we were at that time looking for a `choice' unit for our elder brother in a new development. Initially, as this is an early launch, he brought along his notebook. This report was generated first and it helped us to greatly narrow down the `choice' units. After which, within a matter of minutes, we focused on one or two units that suited him. Next, we generated the Flying Star House Report. Immediately after analysing and deciding on a unit, he managed to book the unit. - Learn more about The Sterling Condominium. What if I have narrowed down my search to a one or two houses and need your advice? aligning on the layout plan. Usually, this North marking can be found on the landscape layout plan or the actual layout plan of the unit. Make a payment at this link before sending us the layout plan for evaluation. What happens if at the end of the day I decide not to purchase the house? Does the above fee covers a second or third on-site presence at another site? No. The above fees is for one specific site per visit per day. As mentioned, no one can guarantee for sure that you can purchase a house on that day. There are no refunds for this service. Are there any other more productive way I can go about selecting a house?